It is day 1527 and the UK-9 server is in the 57th age. House 10 has generated 636,198 glory in the 4 days since the end of the last glory round, which is 159,049 per day. There are 3 more Glory rounds left in the 5th age. 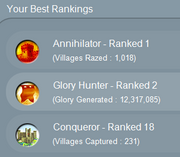 There are 1,363 players on the server, of which 588 have only 1 village (43%). It is day 1542 and the UK-9 server is in the 5th Age. House 10 has 9 stars and Houses 13, 14 and 19 are still in the glory race. There are 1,314 players on the server. It is day 1552 and House 10 has earned 473,473 glory in the last 3 days since day 1549. That is a rate of 157,824 per day. At that rate this glory round will end in (4,000,000 - 473,473 = 3,526,527) / 157,824 = 22 days from now = July 24th. That puts the beginning of the 6th Age somewhere in August. It is day 1568 and the UK-9 server is in the 5th are with only 2 more glory rounds to go. House 10 has earned 3,002,850 glory in the last (1568-1549-19 days) which is a rate of 158,044 per day. That leaves 7 days left in this glory round and 58 to 59 days left in the 5th age. It is day 1589 and the UK-9 server is in the last glory round of the 5th age. House 10 has generated 2,218,386 Glory in the last (1589-1575=14) days for a rate of 158,456 per day. At this rate the 5th age ends in 12 days. It is day 1650 on the UK-9 server. The 6th age is moving along. House 10 has 7 stars. During this round they have generated 528,156 Glory over 3 days which is a glory round every 6 days. The final age should occur in about a month. The Final Age should trigger some time next week. Firefly will have to manually drop all the factions (a process they dislike). And we will see if they remember to reset the prize tables as well.